Foxcroft Academy junior Hyatt Smith upends Wells High School senior quarterback Michael Wrigley during the second quarter of the Class D championship on Nov. 18, 2017, at Fitzpatrick Stadium in Portland, as Pony junior Caleb Ladd and Wells junior Morgan Welch-Thompson look on. High school football across the state clearly is a numbers game these days, with many programs struggling to maintain sufficient participation numbers not only for a given season but to sustain themselves over time. Concussion concerns are one reason for smaller roster sizes, as is the competition for teenagers’ attention among not only multiple sports options but social media and work opportunities with college debt looming on the horizon. There’s also the aging Maine population base, which has corresponded into fewer students attending high school statewide than a generation ago. House and his coaching brethren in Class D North, or the Little Ten Conference, are experiencing that trend first hand. This season, six of the LTC’s 10 football teams will begin the season with fewer than 30 players, according to rosters available on the Maine Principals’ Association website. Mattanawcook Academy leads the way with 43 players, followed by Bucksport (35) and defending conference champion Foxcroft Academy and Dexter (30 each). That’s followed by Houlton (27), Mount View of Thorndike (25), Stearns of Millinocket (23), Ellsworth (22), Orono (21) and Washington Academy of East Machias (20). Half of the teams have cooperative arrangements to take in players from neighboring schools without their own football programs but with minimal results. Mattanawcook picked up one player from Penobscot Valley of Howland and one from Lee Academy, while three players from Sumner High School in East Sullivan are on the Ellsworth roster. “There’s just not as many kids playing football, it’s as simple as that, and there’s not as many kids period,” Foxcroft Academy coach Danny White said. So while every coach’s hopes for the 2018 season include the cautionary note, “If we can stay healthy,” the road to the LTC championship is expected to go through some familiar locales. 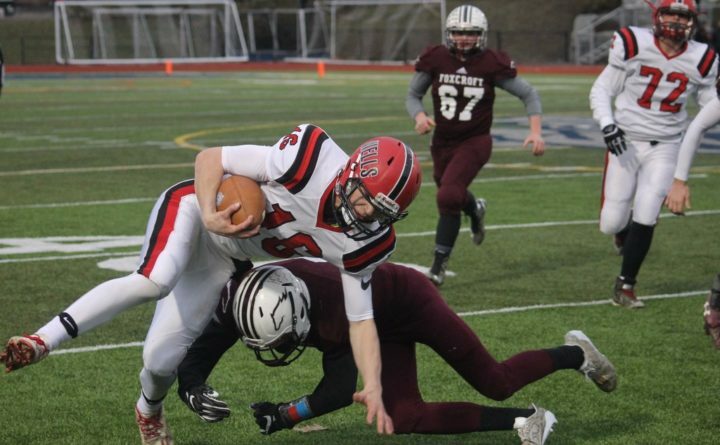 Foxcroft Academy and Bucksport, which met in the Class D North final a year ago, loom as the favorites again this year despite graduating the reigning LTC players of the year in quarterbacks Nick Clawson and Chase Carmichael, respectively. Foxcroft, which went undefeated through league play in 2017, features senior wideouts Hyatt Smith and Jeremy Richard, senior halfback Michaleb Niles and promising sophomore Logan Martin in tandem with senior quarterback Matt Spooner. Bucksport has a new signal caller in junior Brady Findlay, though it is likely to feature more of a run-oriented offense than with Carmichael, who passed for more than 5,000 yards and 50 touchdowns during his career. Senior halfback Carter Tolmasoff represents one of the top league’s speed threats, according to Bucksport coach Joel Sankey. Tolmasoff teams with classmate Lucas Wardwell in the backfield, while sophomore Logan Stanley is a playmaker at wide receiver and slotback. Junior tackle David Gross, one of the top linemen in the region, is coming off knee surgery last February, but Sankey is hopeful he might return to action as soon as midseason. House’s Mattanawcook roster boasts only eight seniors, but the Lynx should be in position to return to the playoffs. The Lynx boast arguably the league’s top all-around athlete in wideout Cayden Spencer-Thompson, a national-level track standout in the triple jump and long jump who returns for his senior year after considering sitting out to focus on determining his collegiate track future. Senior Diondre Duffy moves from fullback to tailback as the primary ballcarrier, while veterans Dakota Pate and Devon Lujan provide leadership along the line of scrimmage. Seniors Alex Brown and Kris Milner — both former wide receivers — and junior Cody Hanscom are all in the mix at quarterback. “We really don’t know what we’re going to be yet, and as we figure out what we’re going to be that’s when we’ll decide on who it’s going to be,” House said. Dexter, the fourth LTC semifinalist a year ago, returns six starters on offense and defense despite having only four seniors on its roster. Senior G/DT David Kirshkain and junior QB/LB Logan Perkins are among the team leaders, along with seniors Dillon Allen, Caleb Weeks and Ryan Davis. Among other contenders, Ellsworth-Sumner boasts a big-time playmaker of its own in Javon Williams, a 6-foot-1, 180-pound senior who plays both tailback and quarterback. Williams started this season at QB for the Eagles as junior quarterback Connor Crawford was sidelined with mononucleosis. Crawford hopes to be cleared to see some game action in time for a Sept. 7 game against Orono, according to his father, Ellsworth-Sumner head coach Duane Crawford.